After about five months, it’s our first time to go fishing again. This Sunday, my father asked us (my husband and I) to take him fishing. I assume this fishing activity as a therapy for my father. He forgot how to use the fishing rod. We taught him again until my father can swing the rod; but he hasn’t got yet his patience back. After two hours fishing with no result, he wanted to go home. I didn’t take picture of my father. 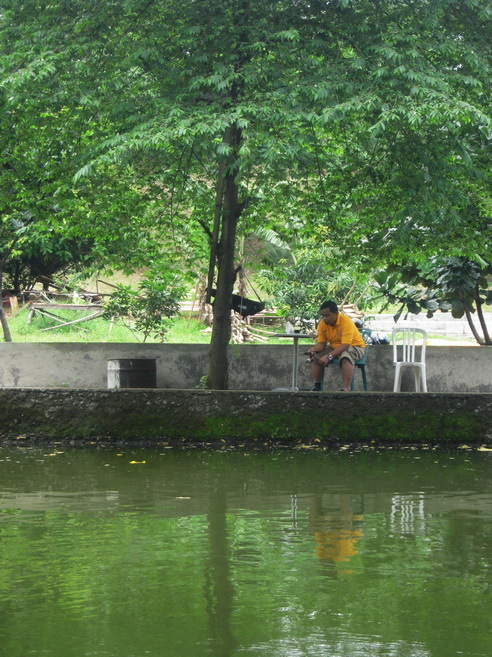 My husband was also fishing; but he’s got no fish as well. Some Yellow, please come and see. Great spot of yellow amongst the green! Fishing is a good way to think and pass time. In Singapore and West Malaysia, they open up fish ponds for people to fish. May be u look for these to take your Dad. Love the reflections in the photo. Great shot. what do you call that tree? it has tiny sweet fruits, right? what a nice view and a patience fisherman :-) did you caught a fish too? Visiting for MYM, hope that you can return the favor too.